An embodiment of enhanced intellect and intuition, Matthew Serel started his first IT company at the tender age of 14 years. The company, Purecode Consulting, managed technology services for SMB in Long Island, NY. In 2009, one of their clients, a provider of long-term care services, requested a system that not only handled scheduling, payroll, and billing processes but also proactively managed their compliance in a rapidly changing environment. Serel got to work on such a platform and founded AccuPoint, an end-to-end behavioural healthcare and home and community based services practice management software company that can improve the bottom line by automating, streamlining, and reducing administrative- and compliance-related costs. Keeping in view the rising number of regulatory requirements in the healthcare landscape, alongside the chance of human error while billing, AccuPoint eliminates the risks of delayed and inaccurate reimbursement for their providers. The company’s scalable system can be customized to a client’s needs be it any home, community, or clinic-based provider in the healthcare space. The system allows providers to bill insurance through their system enabling such clients to view all their claims, see the reason behind rejected claims, easily make alterations, and resubmit claims incorporating the adjustment code. The company caters to the fields of Applied Behavior Analysis (ABA), licensed home care, substance abuse, specialty schools, Medicaid HCBS Waiver, and more. AccuPoint concentrates primarily on the fast-growing ABA industry. “Though better business for ABA providers implies a higher number of individuals on the spectrum (Autism Spectrum Disorder), we look at our system as not a business for ABA but really a tool for ABA providers to increase efficiency and most importantly improve the quality of care” says Jameson Kimball, the Vice President of Sales at AccuPoint. Here, AccuPoint digitizes the ABA clinical data and helps the healthcare providers submit the claim with the right codes. As the healthcare providers face surprise audits by the regulatory bodies, AccuPoint helps the clients with swift self-audits to ensure that they are compliant. “The typical practice may take up to 30 days to complete an audit, while with our system, it is going to take more like 15 minutes,” states Kimball. AccuPoint upholds the intelligent philosophy of viewing their client’s company as a living organism that is going to work only if it evolves. Accordingly, to upgrade the clients’ performance, AccuPoint constantly adds new features to its services such as the parent portal for additional transparency in the communication between parents and providers, with improved billing of secondary payers. Acknowledging the importance of enhancing customer experience, AccuPoint provides a 24/7 helpline to its clients and prides itself on its goal to answer by the second ring. The company resolves the clients’ doubts, efficiently and promptly, instead of exchanging a dozen e-mails for problem resolution. 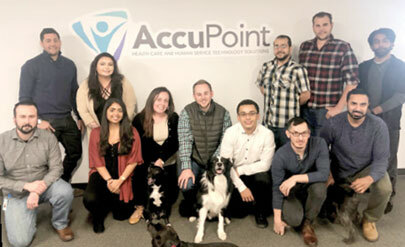 In fact, there have been instances wherein the president of AccuPoint himself has aided clients on the phone in the middle of the night, epitomizing the company’s regard for customer satisfaction. AccuPoint has also created its Facebook group of clients and employees, which allows clients to interact with one another, post new feature requests, and vote on the requests that other people have made.